I have been counting down the days for longer hours of sunshine, warmer weather, spring flowers and the popular spring foods! 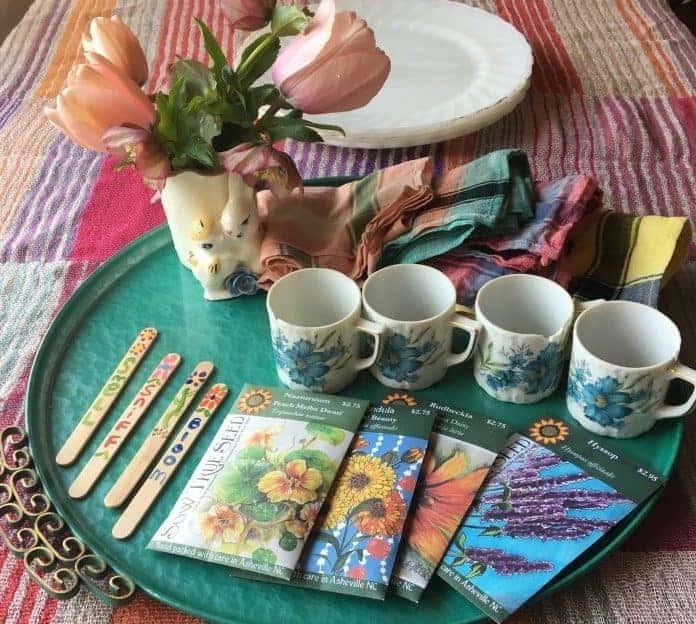 And I wanted to celebrate spring with you by providing a Garden Party Themed Menu which includes seasonal produce available coming soon at local farms near you! Some take home gifts and décor are as important as a spring food menu! Setting the mood and party favors are a big part of the fun with this party. I hand painted a few garden stakes and got packages of seeds for my guests. A few small terra cotta pots with a geranium would also be a very awesome take home. Some hand cream for gardeners dry hands would also be a great take home gift. Tuck all of it into the little flower pots and tie raffia around it! I also have some vintage watering cans that also look very cute for decorations with cut flowers! I love this little rabbit and baby chick vase with a few tulips and Lenten roses from my garden. You can even ask your guests to dress up in vintage party outfits if there are daring! For the menu, I wanted it as fresh and local as possible. It turned out to be very colorful also! I used shrimp for my kebobs but you could substitute meat or meat alternative instead of seafood. 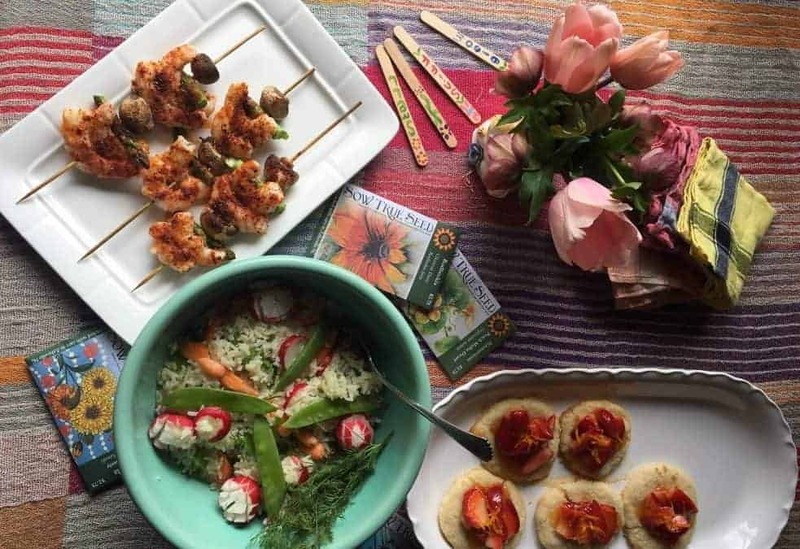 Here are the recipes for my garden party menu featuring plant based spring recipes. Feel free to mix and match so you can come up with your own collection of spring menus! 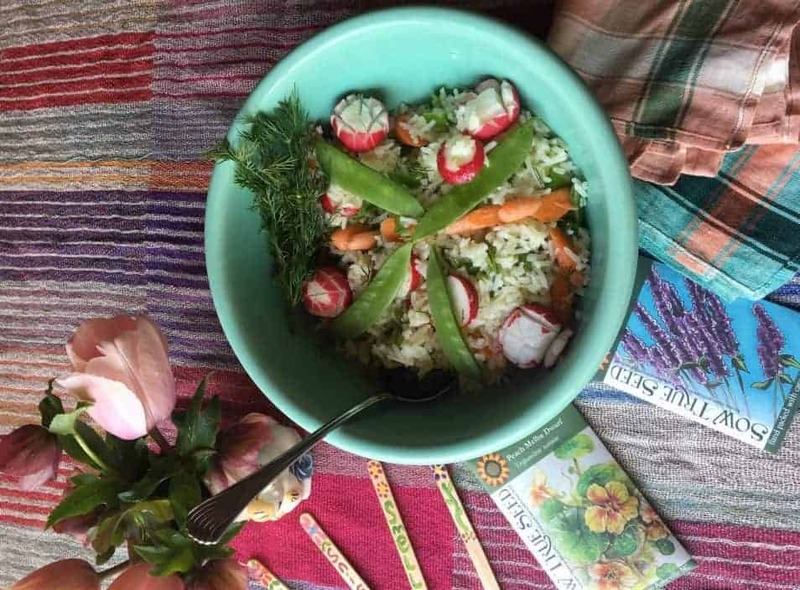 This salad is so colorful with radishes, carrots and snow peas. And it just tastes like spring! I love the little radish roses to garnish this lemony salad. I also used some whole snow pea pods and large slices of carrots along with some fresh dill sprigs! You can vary the vegetables of this salad based on the season! For a variation: Thinly sliced green olives with pimentos would look great and taste awesome in this also but I did not use them. Basmati rice would also be great for this! Cook jasmine rice according to directions and let cool. While rice is cooking chop radishes, carrots, snow peas and green onions. Squeeze and grate lemon. In a mixing bowl, add rice and add lemon juice, salt, pinch of sugar, olive oil and Parmesan cheese. Stir well. Lightly toss in the vegetables and dill. Add salad into a serving bowl. Garnish and serve. Can chill in refrigerator up to two days before serving and it still holds up great. Spring vegetables, shrimp and blackened seasonings make a delicious combination. 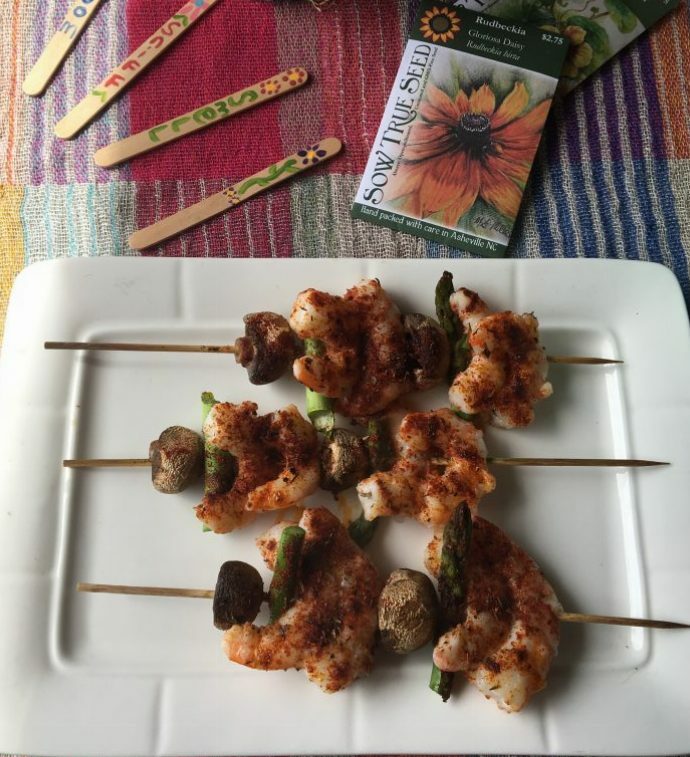 I love these shrimp kabobs with spring vegetables drizzled with olive oil and a spicy seasoning. They taste just right! Thread 2 pieces on shrimp on each kabob followed by half of an asparagus spear and mushroom. Repeat with shrimp, asparagus and mushroom. On a cookie sheet, add the kabobs. Drizzle with olive oil. Sprinkle lightly with salt and half of seasoning. Place low on broil and cook until shrimp is pink and opaque. Flip over sprinkle with rest of blackened mix and cook until the other side is pink and not opaque. Made with gluten free crust and spring strawberries with a little orange essence! The gluten free cookie crust is light and crumbly. The strawberries and orange taste great together. Add the topping soon before serving because the topping can make the crust a little soggy. They can hold up for an hour or two after making. Preheat oven to 350 degrees. In a mixing bowl, mix flours, salt and sugar. Mix well. Cut in softened butter. Divide dough into 6 balls. On a cookie sheet, add parchment paper and flatten the 6 balls into a cookie shape. Bake for about 8- 10 minutes until slightly browned around the edges. Take out and let cool right on the sheet. Add strawberry topping. In a small sauce pan, add sugar and orange juice. Carefully mix the cornstarch. Heat and constantly stir until the liquid thickens. Take off stove and allow to cool well. Toss in the strawberries and mix. Add the strawberry topping over the cookie crust. Drizzle any additional sauce to the tartlet. Garnish with some orange zest. 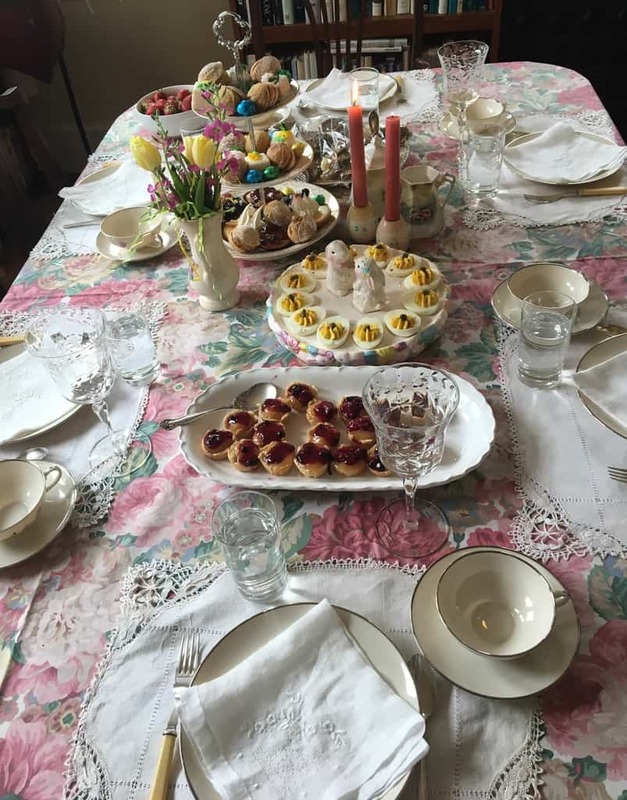 You might even go with a Mother’s Day High Tea Menu with Victorian tea party food like a recent celebration at my friend Emily’s house. She and our friends made finger sandwiches, mini quiche and salads. And I brought some of my mini tarts! For Emily’s High Tea Spring Menu, she served some of her best tea that she had been saving. She also served champagne in a large vase filled with her mother’s marble collection! Here are a couple of pictures from her spring party! 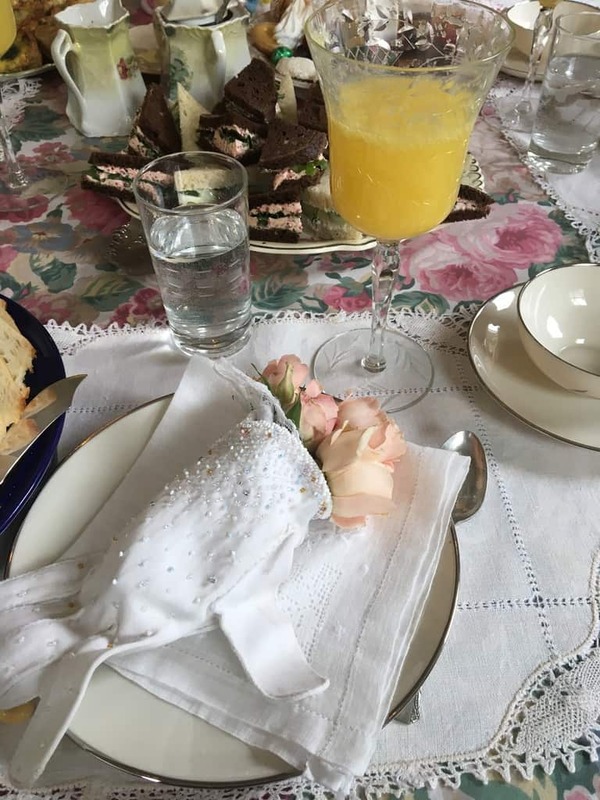 Here is my friends place setting full of vintage linens, her grandmas dishes and scrumptious food! Even the beverage table can look decorative! 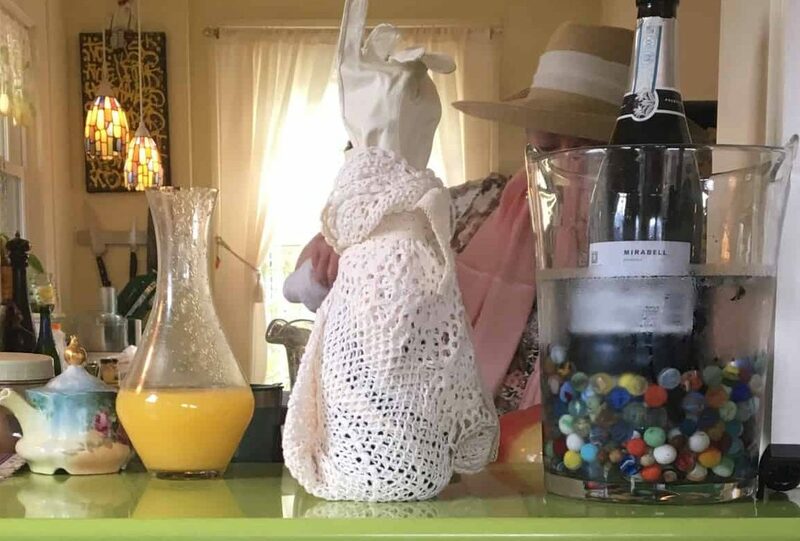 Here is Emily’s mother’s marble collection in a large vase and our friend Trish’s creative draping the champagne bottle she brought in vintage linens and topped with a vintage women’s white glove that has lost it’s match! Drape the champagne bottle in linens and top with a vintage ladys glove or put in a large vase with vintage marbles. Look at the party favor that my friend Trish made! A rose posey in a mismatched glove! What a great way to recycle something beautiful and make it useful! Emily made beautiful to go boxes with goodies to take home with us! Our friend Trish made posies for each of us with delicate roses using mismatched vintage gloves. Here I am heading out the door to Emily’s party. My husband took a picture before I left to have fun with my friends! 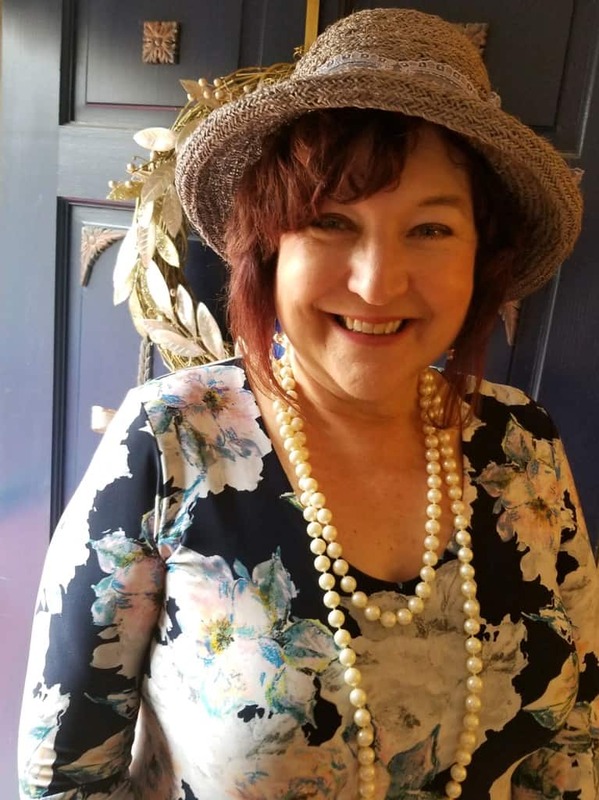 I tried to put together the perfect high tea outfit that included my grandmas pearls, a vintage hat and a flowered dress! What Do You Serve at a Luncheon? I would love to hear! It is always great to share ideas between friends! I hope that this spring celebration menu will inspire you to get real creative with this weather change. As a registered dietitian nutritionist in Asheville NC, I enjoy sharing some of my favorite recipes in my kitchen for you to make in yours. I am so glad that you stopped by! 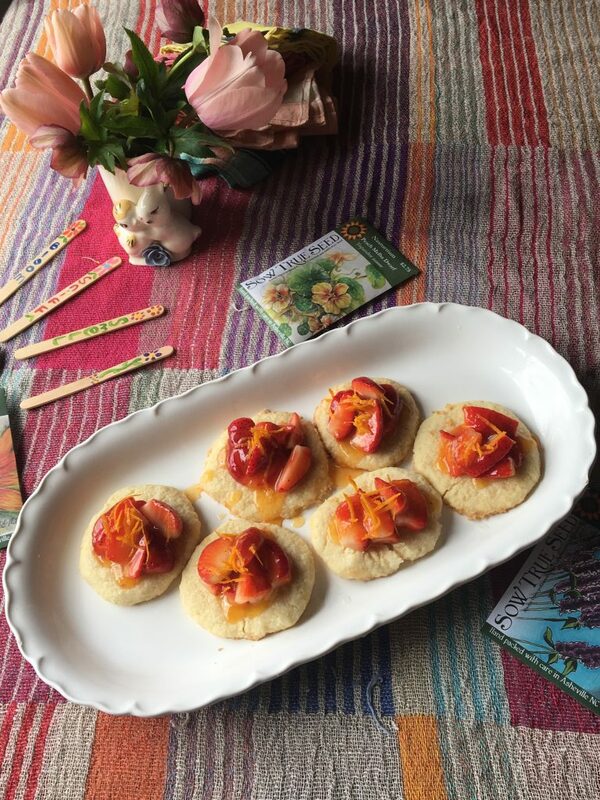 You can also find additional spring celebration recipes from my friends at the Recipe Redux below! 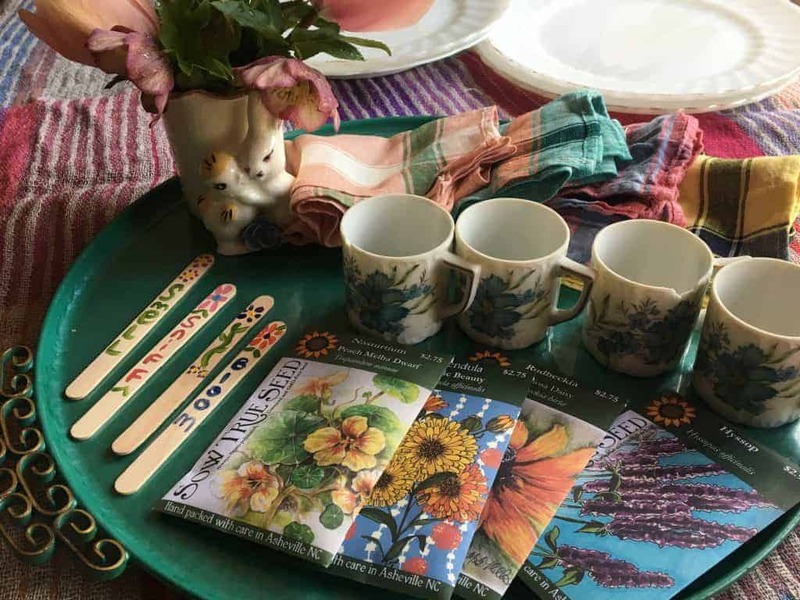 Get your garden celebration going with some of these gift giving ideas!